Huge amount of performance and rear-drive fun for the money. Thunderous V8. Surprisingly practical with four-door body and large boot. V8 engine has an insatiable thirst for fuel. Group 50 insurance. Residual values aren't great. On the Road Price of £51,200 includes number plates and delicvery to dealer (£700 inc £116.67 VAT), £950 first year registration VED and new vehicle registration fee of £55. The Vauxhall VXR8 GTS costs around £55,000, has all the subtlety of tank and is about as efficient as one, with official economy of 18.5mpg. For the average car buyer – even one who appreciates high performance – there’s nothing about it that makes any sense. But if your life is like a big game of Top Trumps then its blend of price and performance will hold lots of appeal. The brutal, 6.2-litre supercharged V8 produces 585PS and a huge 740Nm of torque – figures that wouldn’t look out of place for a supercar. Performance is suitably impressive – 0-62mph takes 4.2 seconds and top speed is limited to 155mph. If you want a new car with more than 500PS there is no cheaper option. Drive is sent to the rear wheels, so judicious use of the throttle pedal is essential in order to maintain traction, whether the manual or automatic transmission is specified. 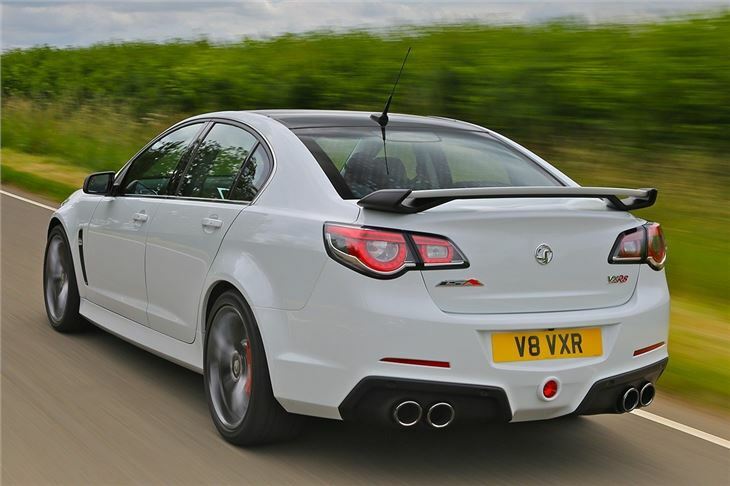 That said, the VXR8 isn’t just a crude way of destroying expensive tyres – it has selectable drive modes, clever suspension and electronics that try hard to keep things on the straight and narrow. The result is surprisingly capable handling and cornering grip. Even so, it won’t take fools lightly - more effort and delicacy is required to drive a VXR8 than something like an all-wheel drive Audi RS model though bends. It’s the same story in town. The VXR8 GTS is big, making multi-storey car parks and narrow streets something of a challenge. On the plus side, that size means it’s practical. The back row is more than big enough to seat adults in comfort and the boot is big – though the lack of a hatchback limits its usefulness. Build quality isn’t bad, but nor is there anything particularly special about the dashboard layout or choice of materials – it just feels like any Vauxhall. The only other car on sale with the same sort of muscular, blue-collar personality as the VXR8 is the Ford Mustang V8, which is significantly cheaper, but less powerful and less practical. For showing off, the VXR8 is great, but it’s also huge and thirsty, while there are better - albeit slower - driver’s cars on sale for less money.